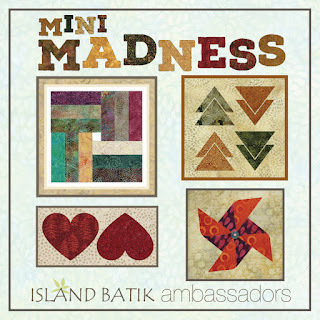 When I saw this link on quiltshopgal, I just HAD to try it and it fit perfectly with the IB mini theme too this month! This QAL allows you to work on one, or all mini blocks, designed by Hope (Hope’s Quilt Designs) which you can download from Craftsy for free. Just stitch out a block and share via the linky tool, before March 15th, to enter to win prizes. I downloaded two but decided to “just” do the churn dash block. Here’s my pieces cut out, I used some scraps of purple leftover from a project I’m doing for them for market. The first was the HSTs and they are just tiny!! They got trimmed to 1” WOW!! I decided from the beginning to make 4 blocks, 2 opposite blocks- here I already sewed one little bit on the machine before taking the picture, so that’s why the bottom right is missing part of it. the center is 1/2” now and the back is really tight! even though I ironed the snot out of it, it wouldn’t lay completely flat- fabric has snot right?? But it didn’t matter much as I’m sure you can guess what I made with the 4 blocks!! and stuffed with crushed walnut shells for a pincushion!! What a cute mini Bea and a pin cushion.....your favorite!